The Private Sector is NOT Doing Fine | How’s the Federal Government Doing? A couple days ago, Joe Weisenthal wrote an article, inappropriately entitled, “Here’s What’s Really Happened to the Private Sector Under Obama”, in which he sought to prove why Mr. Obama will be reelected. His premise, like Obama’s, is that the Private Sector is doing fine, but State and Local governments aren’t. There was no mention at all of how the Federal government, the part of the economy Mr. Obama actually influences, is doing (see the chart above). However, what Mr. Weisenthal actually did was highlight the main reasons why Mr. Obama should not be reelected, and should lose by a landslide in November. I hate to burst Mr. Weisenthal’s bubble, but he’s in La-La Land if he thinks his 24 chart presentation will convince even Mr. Obama to defend his own senseless remark. First of all, Mr. Weisenthal’s article was inappropriately titled because by definition, the “Private Sector” is not “under Obama”, as he so implies. To the contrary, the only part of the economy Mr. Obama presides over is the Federal government, whose $16 trillion debt, $5.3 trillion of which has been added by Obama himself, actually imposes a drag on the private economy. Yet, Mr. Weisenthal supports Mr. Obama’s plea for more Federal borrowing, to be expended at the State and Local level. Secondly, Mr. Weisenthal doesn’t provide any benchmarks. It’s as if he’s comparing the pre-2010 Obama to the post-2009 Obama. That’s all well and good, but if this were baseball, Mr. Obama would be heading back to the Minor Leagues (and so he is). Here’s a brief summary of Mr. Weisenthal’s main points (in bold type) and my comments. You may view his 24-chart catastrophe here. ‘Corporate profits after tax are higher than ever.’ – I concur. But this is primarily due to corporate austerity, which has nothing at all to do with Mr. Obama. Although some corporations have been able to increase sales, most all of them have actually improved profitability through reductions in labor and other operating costs. We call this productivity, which is something Mr. Obama could learn from, but not something he practices within his sphere of influence. Rental Income is higher than ever. – I agree. But, the fact that more than 3.3 million families lost their homes since September of 2008, and are now forced to rent, is hardly anything to boast about. Could there be any other reason for the 125% increase in rental income since the recession began, such as some program implemented by Mr. Obama? The claim that rental income has reached a new record, under the policies of Barack Obama, is more of an admission of failure than anything else. ‘Gross private domestic investment is coming back nicely.’ – If you consider a rebound to 1999 levels a nice comeback, that’s all fine and well, but I think it’s rather pathetic. By the way, this particular chart has actually moved sideways and to the right since 1999, not upwards. So far in 2012, it looks like most of what should go towards gross private domestic investment is actually being invested into U.S. Treasury’s. After all, someone has to buy all of the newly created Federal debt, and the Federal Reserve appears to be closed for business, at least for the time being. ‘The private sector has been adding jobs steadily since the end of Obama’s first year, and today there are more private sector jobs than there were before Obama took office.’ – Did he say, ‘since the end of his first year’? Of course no good Democrat should ever discuss Obama’s first year in office. It’s as if he took over the reigns in January of 2010, instead of 2009. In reality, the Private Sector lost a total of 5,051,000 jobs between January of 2009 and February of 2010, before things started to turn around. Even still, the Private Sector has only gained 55,000 jobs over the last three years and four months (not including the 839,000 jobs lost in January of 2009). This represents an annual growth rate of just 0.015%, and a total growth rate of a mere 0.050%. 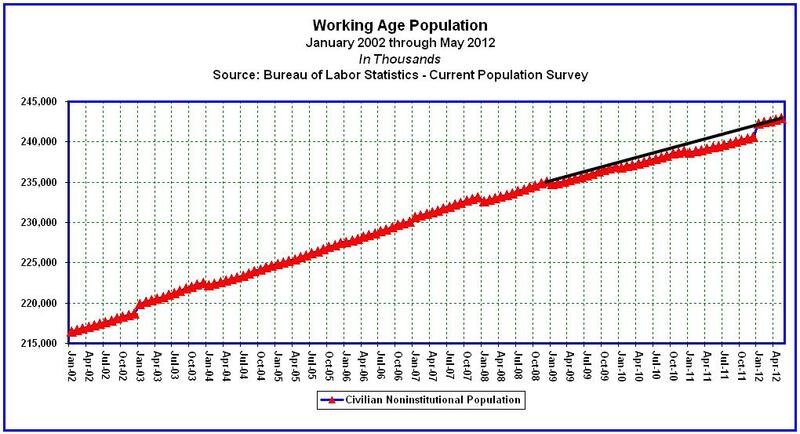 Meanwhile, the Working Age Population increased by more than 8.2 million over the same period. So let’s see, that’s 55,000 private sector jobs created since Obama took office, for 12.2 million unemployed workers (4.0 million who had already lost their jobs before Obama took office, and another 8.2 million who reached working age during his term). That’s gotta be a record alright, but it’s not exactly the kind of record either Mr. Weisenthal, or Mr. Obama should be ginning up. ‘It would be great if the [Private] Sector were stronger, but things are going up and to the right in these charts.’ – Yes, and things are going up and to the right in some other charts as well. 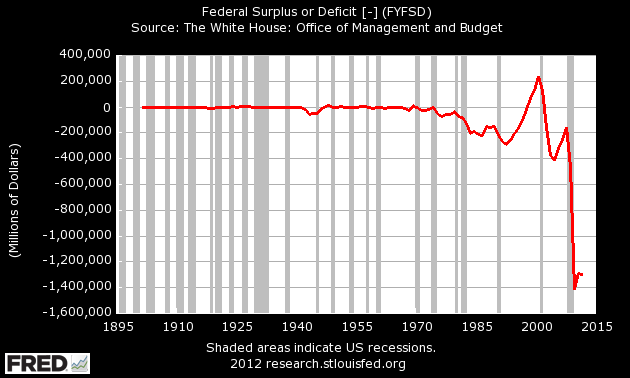 For example, Federal budget deficits (shown below) are far outpacing any of the statistics above. The fact that a chart is moving upwards and to the right doesn’t mean anything on its own merits. The following questions come to mind. Is this good or bad? What’s the trend? What’s the growth rate? Is it keeping pace with population growth? How is its performance against other benchmarks? Comparing the last two years and five months of Obama to his first year in office, and then drawing conclusions, is like saying that a baseball player with a batting average of .000 in his first year and who is now batting .00015 has improved. Yeah, he’s improved alright, but he won’t be playing in the Majors next year. ‘Total government employment is far below where it was when Obama started office.’ – This is true, and it’s actually a good thing. Who can afford to pay for more public sector workers when more than 23 million Americans are either unemployed or underemployed? Mr. Weisenthal and Mr. Obama seem to think that more State and Local government hiring will solve our unemployment problem. What they really mean is that the Federal government should take more money from a shrunken private sector labor force to pay others. What planet have they been living on? Apparently neither one of them received the memo issued in November of 2010. ‘Why is employment going down? Because state and local government spending growth has hit its lowest level ever.’ – The first part of this statement is false; the second part is true. To say that the decline in State and Local government spending is causing the decline in employment may fire the emotions of a few State and Local government workers, but it’s simply untrue. State governments employed a record 5,198,000 workers in January of 2009, versus 5,073,000 today. Local governments employed a record 14,588,000 in January of 2009, versus 14,077,000 today. So State and Local government employment is only off the mark by 636,000 from an all time high in January of 2009. If all 636,000 workers were rehired tomorrow, how would that solve the problem for the 23 million Americans who are either unemployed or underemployed? Although it’s true that State and Local government spending has declined, the reason is that revenues have plummeted. Unlike the Federal government, State and Local governments can’t spend money they don’t have. Nor should they borrow what they can’t repay. The decline in revenues is due to the downturn in real estate values, high unemployment, and the need to cover unfunded pension liabilities. With legal requirements to balance their budgets and an inability to print their own currencies, State and Local governments are prohibited from implementing the disastrous borrow-and-spend policies of Washington, DC. During the crisis, the state & local pain was mitigated by aid from the Federal Government, but that has since dropped off dramatically. – He’s referring to the part of Obama’s $831 billion Stimulus Program that went to State and Local governments in 2009/2010. Remember that? The problem is that it didn’t work then, and it won’t work now. The reason it didn’t work the first time is because it’s not the Federal government’s job to tell State and Local governments what to do. The Federal government is not in charge of State and Local budgets and thus cannot mandate more hiring. State and Local governments legislate according to the desire of their residents; they don’t take orders from Washington. State and Local government officials actually have to live under the policies they implement. They are in-touch with their constituents, while Mr. Obama seems to be completely out-of-touch with most of America. Even if the Federal government handed State and Local governments another $1.0 trillion to hire more workers, how would they pay those same workers in subsequent years? And if they have to pay the money back as well, how will they be able to pay the additional workers while repaying the loans? Ideas that make sense to a desperate reelection campaign are not always practical in the real world, or in the best interests of anyone other than the candidate. Think about it. Mr. Obama presides over the Federal government, whose $16 trillion national debt imposes a drag on the Private Sector. 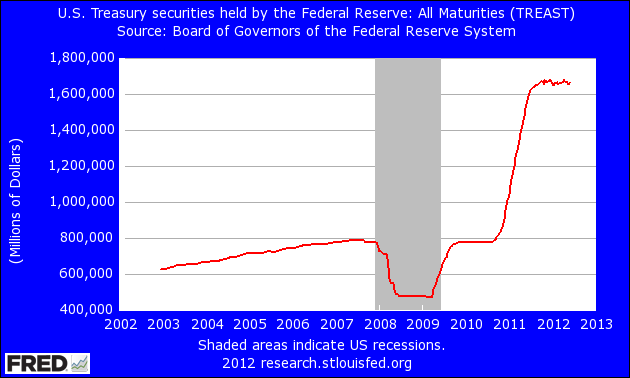 For example, in 2011 the Federal Reserve monetized 77% of the Federal deficit (see chart below). By the way, that’s the opposite of what it said it would do. Eventually the Fed will have to reduce its Treasury holdings, and as you can see, the last time it did so the economy went straight into recession. Maybe the Fed can afford to sit on piles and piles of low interest Federal debt forever, but that doesn’t mean everyone else can, or will. The question Mr. Weisenthal ought to be asking himself is where will the Federal government get the money to repurchase this debt? It will ultimately come out of the Private Sector, through higher taxes, fees, and fines. The prospects for additional Federal borrowing are growing slim. Mr. Weisenthal’s charts don’t provide any benchmarks, so I will. Assuming that Private Sector Employment should grow at the same rate as the working age population, approximately 1.0% annually, the chart below compares actual Private Sector jobs growth to a 1.0% benchmark, beginning with the terms of the last 5 presidents. By the end of Ronald Reagan’s first term, Private Sector Employment beat the benchmark by 2,088,000 jobs. He was reelected based on his pro-business policies. By the end of Reagan’s second term, Private Sector Employment had topped the benchmark by 8,248,000 jobs. By the end of George H.W. Bush’s only term, Private Sector Employment fell behind the benchmark by 2,466,000 jobs. By the end of Bill Clinton’s first term, Private Sector Employment beat the benchmark by 6,901,000 jobs. He was reelected based on small government, pro-business policies. By the end of Clinton’s second term, Private Sector Employment had topped the benchmark by 13,291,000 jobs. By the end of George W. Bush’s first term, Private Sector Employment had fallen behind the benchmark by 5,562,000 jobs. He was reelected based upon his strong defense and anti-terrorism policies, not for his economic record. Were it not for the War on Terror, Mr. Bush would have lost his reelection bid. 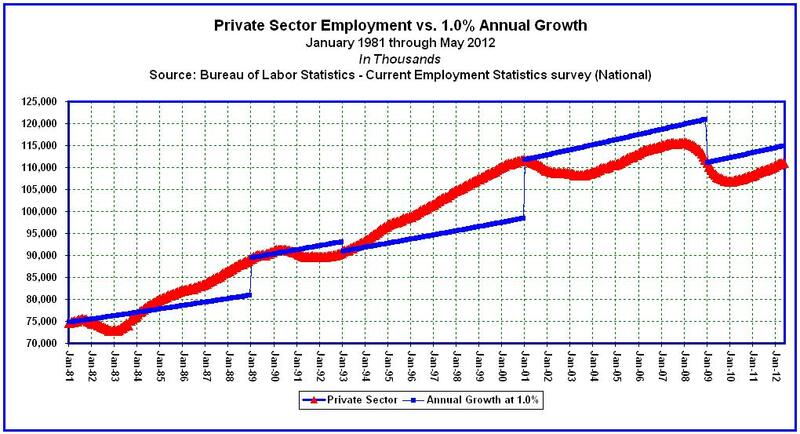 By the end of W’s second term, Private Sector Employment had fallen behind the benchmark by 9,100,000 jobs. After three years and five month’s of Barack Obama, Private Sector Employment has fallen behind the benchmark by 3,801,000 jobs. Short of finding another reason, such as convincing Americans that the killing of thousands of innocent civilians in drone attacks is important to their security, Obama’s anti-business policies should make this his final term. Who wants more Federal workers? Instead of telling State and Local governments what to do, Barack Obama should spend some time figuring out how to shed the 29,000 Federal positions added under his administration. Assuming that Federal Government Employment should grow at 0.0% or less, the chart below compares actual Federal government jobs growth to a 0.0% benchmark, beginning with the terms of the last 5 presidents. By the end of Ronald Reagan’s first term, Federal Employment exceeded the benchmark by 3,000 jobs. By the end of Reagan’s second term, Federal Employment exceeded the benchmark by 195,000 jobs. By the end of George H.W. 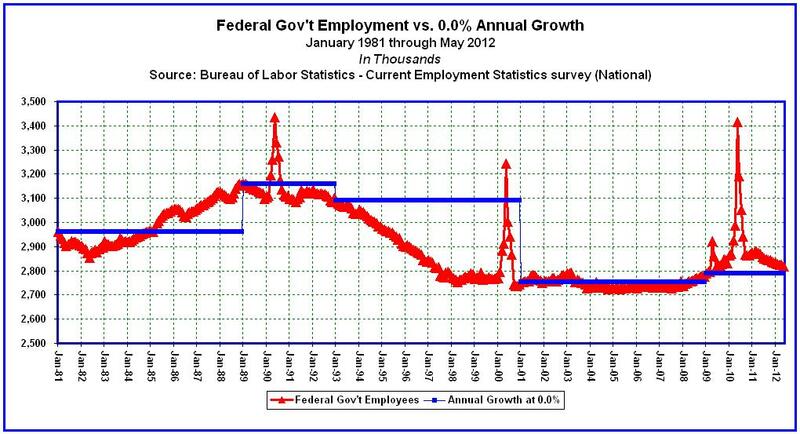 Bush’s only term, Federal Employment dropped below the benchmark by 57,000 jobs. By the end of Bill Clinton’s first term, Federal Employment dropped below the benchmark by 253,000 jobs. By the end of Clinton’s second term, Federal Employment was below the benchmark by 347,000 jobs. By the end of George W. Bush’s first term, Federal Employment dropped below the benchmark by 25,000 jobs. By the end of W’s second term, Federal Employment exceeded the benchmark by 24,000 jobs. After three years and five month’s of Barack Obama, Federal Employment has exceeded the benchmark by 29,000 jobs. Not that the Federal government has any control, but assuming that State Government Employment should grow at the same rate as the working age population, approximately 1.0% annually, the chart below compares actual State government jobs growth to a 1.0% benchmark, beginning with the terms of the last 5 presidents. By the end of Ronald Reagan’s first term, State Government Employment dropped below the benchmark by 5,000 jobs. 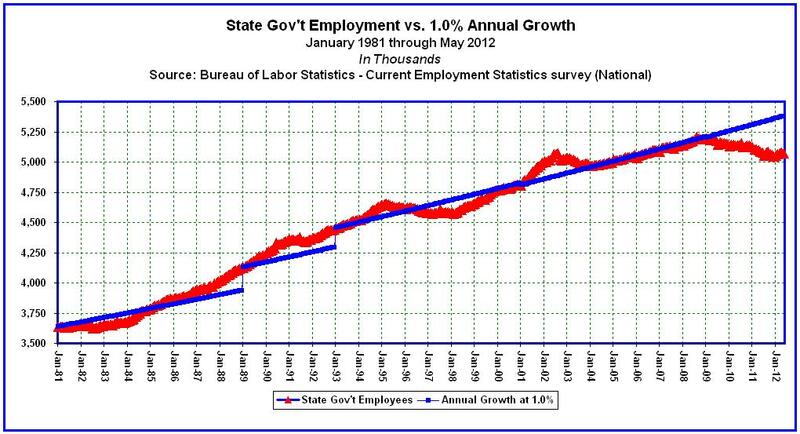 By the end of Reagan’s second term, State Government Employment exceeded the benchmark by 183,000 jobs. By the end of George H.W. Bush’s only term, State Government Employment exceeded the benchmark by 149,000 jobs. By the end of Bill Clinton’s first term, State Government Employment dropped below the benchmark by 56,000 jobs. By the end of Clinton’s second term, State Government Employment was below the benchmark by 9,000 jobs. By the end of George W. Bush’s first term, State Government Employment dropped below the benchmark by 6,000 jobs. By the end of W’s second term, State Government Employment was below the benchmark by 16,000 jobs. After three years and five month’s of Barack Obama, State Government Employment has fallen behind the benchmark by 306,000 jobs. The Federal government has no jurisdiction over Local governments, but assuming that Local Government Employment should grow at the same rate as the working age population, approximately 1.0% annually, the chart below compares actual Local government jobs growth to a 1.0% benchmark, beginning with the terms of the last 5 presidents. By the end of Ronald Reagan’s first term, Local Government Employment dropped below the benchmark by 622,000 jobs. 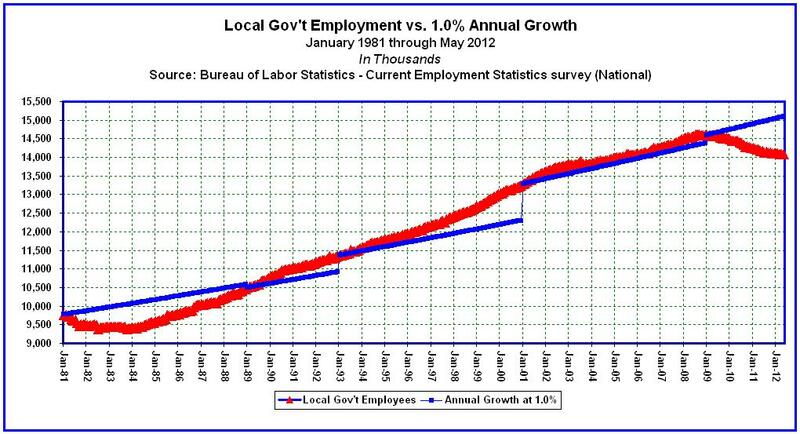 By the end of Reagan’s second term, Local Government Employment was below the benchmark by 118,000 jobs. By the end of George H.W. Bush’s only term, Local Government Employment exceeded the benchmark by 416,000 jobs. By the end of Clinton’s second term, Local Government Employment was above the benchmark by 943,000 jobs. By the end of George W. Bush’s first term, Local Government Employment exceeded the benchmark by 151,000 jobs. By the end of W’s second term, Local Government Employment was above the benchmark by 207,000 jobs. After three years and five month’s of Barack Obama, Local Government Employment has fallen behind the benchmark by 1,018,000 jobs. 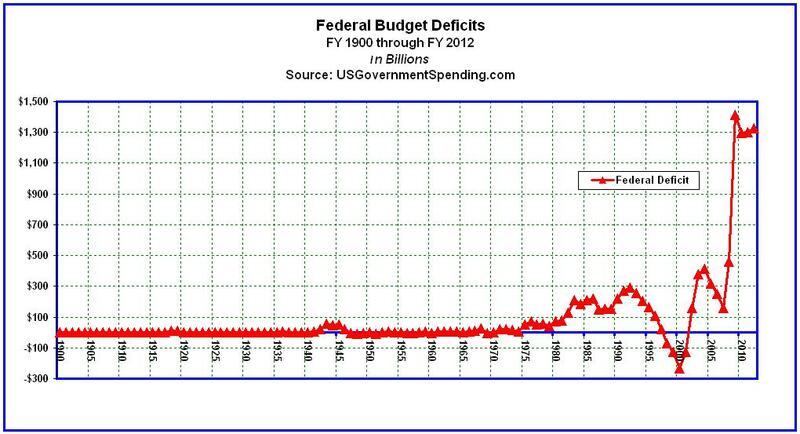 This is certainly not due to any lack of Federal spending. If the creation of 55,000 net Private Sector jobs, over 40 months, for 23 million unemployed or underemployed Americans, is considered “doing fine”, then Mr. Obama’s prospects for a second term, one in which another 8.0 million plus will reach working-age, should be nipped in the bud right now. Mr. Obama had a fair shot and his policies failed. If he is so concerned about State and Local government employment now, then why didn’t he focus his stimulus plan on this sector back in 2009? Instead he placed the emphasis on extending unemployment benefits, which actually exacerbated the problem. And why did he focus so much of his time on passing Obamacare, instead of worrying about how 23 million unemployed and underemployed Americans would be able to afford it? This isn’t Little League. When you’re batting .00015 in the Major’s, the chances of keeping your job are pretty much nonexistent. If Barack Obama wants to control State and Local government budgets, then perhaps he should be running for Governor, Mayor, State Senator, County Commissioner, or City Councilman. If he wants to take credit for improvements in the Private Sector, then perhaps he should take a shot at running a corporation, in his next career. But if he wanted to continue as President of the United States, he should have paid more attention to the Federal budget while he had the job. There’s an old saying, “If you want a different result, try something different.” So make up your mind today, do you want more insanity, or something different?